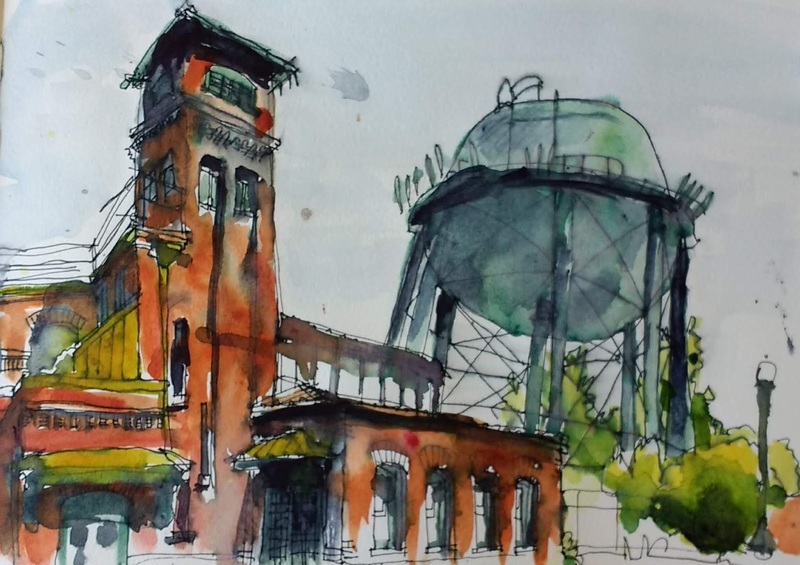 This sketchcrawl takes in two destinations - the Oregon Rail Heritage Museum and Oaks Amusement Park! 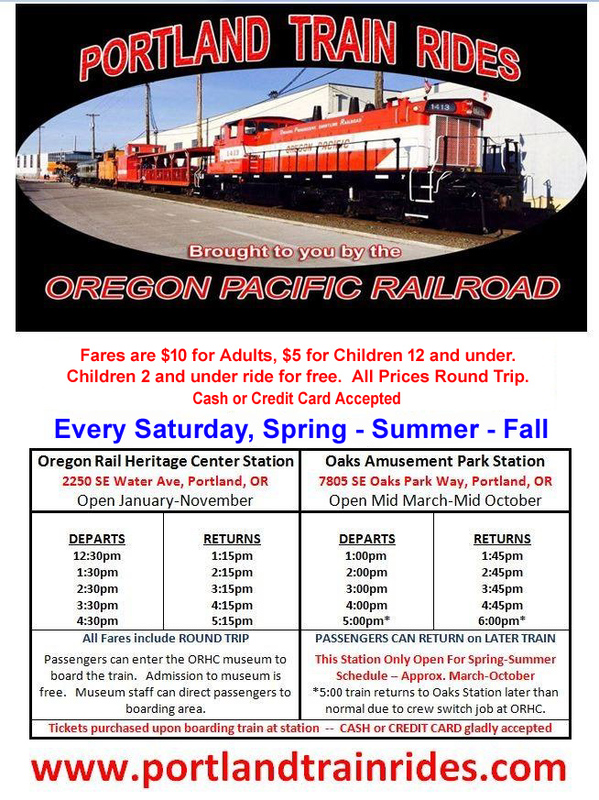 This includes an optional ($10 round trip) ride on the Oregon Pacific Railroad, from the Oregon Rail Heritage Museum near OMSI to Oaks Amusement Park. If you prefer not to ride the train, you can drive between the two locations or join us for just one segment of the sketchcrawl. Both the rail museum and the amusement park have free entry. We can also take in Oaks Bottom Wildlife Refuge which is immediately adjacent to Oaks Amusement Park. Since we'll be moving around a lot, this will be a great day to work small or loose or both! Our starting location is near the OMSI MAX Station on the Orange line. Parking is available under the 99E viaduct, off SE Caruthers. Since the rail museum doesn't open until noon and there aren't any cafes in the area for a leisurely meetup, we will be starting a little later than usual. See the train schedule for alternate departure/arrival times if you'd like to customize your sketching day. 11:30am: Meet in front of the Oregon Rail Heritage Museum, 2250 SE Water Avenue (see map below). 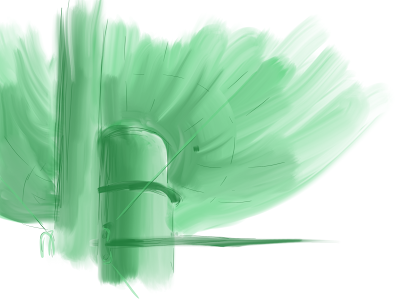 We'll start by sketching this interesting area of crossing rail lines and freeways. Since we aren't starting at a cafe, please take care of your urgent food, caffeine, and bathroom needs before we meet! We'll share sketchbooks along the way, perhaps on the return train. I started out doing a large chunk of the firehouse from a bit of a distance behind it. 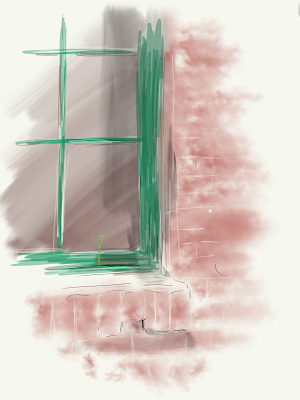 And then wandered around till I was near the front, and noticed one tiny plant clinging to a toehold on a window sill. 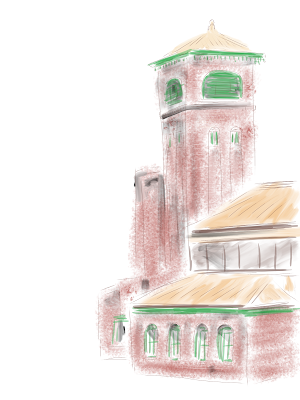 And finally, I tried a small chunk of the water tower behind the firehouse, blocking in the forms and shading. But the sun kept wandering in and out of the clouds, and the shadows kept changing. It was a fun day with the Portland Urban Sketchers - and a nice number of new people. Welcome to you all! The weather cooperated with us. I enjoyed seeing everybody spread out at the site. See you next time. The area around the Interstate Firehouse Cultural Center has several interesting things to sketch. There is the Firehouse itself, the water tower, and the MAX. There is also a little cob structure next door. 10:00am - Meet at Red E Cafe (1006 N Killingsworth St, Portland, OR 97217) for coffee, snacks, and socializing. 10:30am - Walk over to the Interstate Firehouse Cultural Center (5340 N Interstate Ave, Portland, OR 97217) and sketch around there. 12:00noon - Optional lunch at Lucky Lab (1700 N Killingsworth St, Portland, OR 97217).